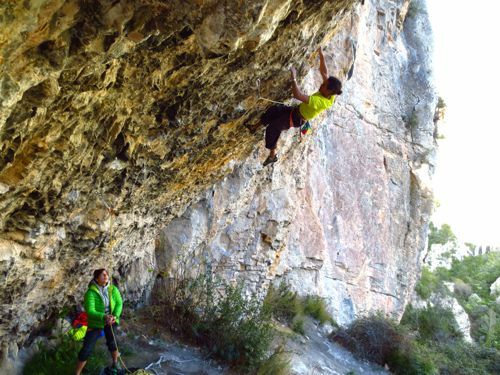 The first real target for the trip was the route Supernova in Vadiello, in the Aragon region of northern Spain. We passed Tres Ponts on the way and got news that the fashionable/trendy areas of Oliana, Margalef etc were packed. Why stand in line to climb when there is so much good rock and great routes all over in this country? Vadiello turned out to be a good choice: almost no people, both limestone and conglomerate, nice places to set up camp near a calm lake with different predator birds circulating around the surrounding conglomerate domes. 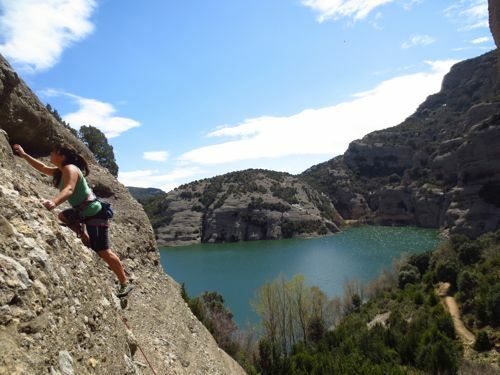 The place is situated about 20 minutes north-east of the town of Huesca. I had felt in miserable shape on-sighting so far on this trip. Maybe I was still recovering from all the hard training this winter? Anyway, I had planned at least 3 weeks on the route so hopefully it would turn out ok in the end. As my shape felt so bad I instead worked the route VERY well, planning to attack once I felt a bit better. On my first red-point, with no expectations, I just wanted to feel how that upper section would feel, probably arriving there pumped like hell. I just went for it, climbed every section perfectly (even better than when working the moves individually which has never happend before) and finally found myself on top of the route. I felt totally empty, no screaming -nothing. Was it really that hard (I’m sure some sertain people reading this will question the routes 9a grade after doing the math)? But who cares? This was for the me a new step in red-pointing, climbing so perfectly was defenately the key to succes. No expectations another. I thought this route would take ages (when dogging the routes before the burn the crux had felt harder than ever) but sometimes unexpected things happen (or actually most of the time unexpected things happen but in a negative sense. Like when my car had been taken away in Barcelona as I had not payed for the parking -but usually never do!). So, what to do next? After climbing 5 routes around this grade it’s maybe time to step up a notch? !